Cricket legends Sanath Jayasuriya, Mahela Jayawardena and Kumar Sangakkara today condemned the recent acts of violence reported in the country and requested the people to stay together and to stand strong at tough times. Cricket star Kumar Sangakkara in a tweet said there should be no place for racism and violence in the country. “No one in Sri Lanka can be marginalised or threatened or harmed due to their ethnicity or religion,” he tweeted. “We are one country and one people. Love, trust and acceptance should be our common mantra. No place for racism and violence. Stand together and stand strong,” he tweeted. Former star cricketer Sanath Jayasuriya requested the people to act in a wise manner and to stand together at tough times. “Disgusting and sickening to see the acts of violence in Sri Lanka,” he tweeted. “I condemn strongly and to bring the involved culprits to justice. I request people of Sri Lanka to be wise and stay together in these tough times,” he tweeted. 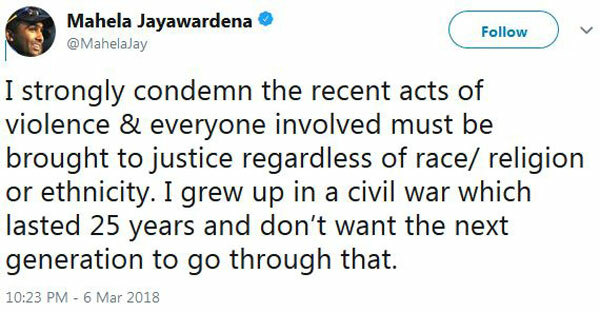 Former Sri Lankan batsman Mahela Jayawardena strongly condemned the recent acts of violence and stated that everyone involved must be brought to justice regardless of race, religion or ethnicity. “I grew up in a civil war which lasted 25 years and I don’t want the next generation to go through that,” he tweeted. If and when Islamic religious fundamentalism spawns Islamist armed extremism it will hurt other communities and the state. Nothing is more likely to generate Islamist terrorism on this island than the news, the sight and the emotions of Sinhala mobs, sometimes with Buddhist monks in their ranks, attacking Muslims. The Sinhala racists made the same mistake with the Tamils. Mob violence was visited upon the Tamils in 1956, 1958, 1977, 1979, 1981 and 1983. The Tamil Tigers were formed in 1976, with Prabhakaran taking over as Chairman in 1978. The vast expansion of Tamil terrorism, as distinct from the commencement of Tamil armed insurgency—not all insurgencies are terrorist– followed Black July 1983. The Sinhala racists attacked the Tamils to “put them in their place” and because they could, with some degree of impunity, since they were the majority. The gamble failed. It is true that the Tamils, by resorting terrorism, lost the civil war and the South won, but the Tamil issue has been internationalized to a point that is irreversible. So the visiting of mob violence upon the Tamils in 1958, 1977 and 1983 did not have the desired result and indeed achieved its opposite. The story is being repeated with the Muslims.